Matthew Hargraves, Chief Curator of Art Collections at the Yale Center for British Art, looks at Paul Mellon as a collector of William Blake and the impact of his lifelong fascination with psychology and psychiatry on his collecting. Mary had introduced Paul Mellon to Jung’s ideas after they met in late 1933; even before marriage they had begun Jungian analysis in New York. In the early summer of 1938, Mr. and Mrs. Mellon journeyed to Switzerland and spent several weeks in Ascona above Lake Maggiore hoping the mountain air would relieve Mary’s chronic asthma. By coincidence Carl Jung was also in Ascona and the couple met the psychiatrist for the first time that summer. They returned the following year and saw Jung again before settling in Zurich in September 1939 to meet with Jung as patients several times a week. Germany’s invasion of Poland in 1939 meant this Swiss idyll could not last. In the spring of 1940 Mr. Mellon took a walking holiday with Jung but the obvious threat from Nazi Germany could not be ignored. He and Mary returned hastily to the United States shortly before the occupation of Denmark, Norway and France in May. By June 1941, feeling compelled to take action, Paul had enlisted in the US army; December saw the Japanese attack on Pearl Harbor and the United States enter the war. Fig. 1: There Is No Natural Religion, Plate 9, “Therefore God becomes . . . . ” (Bentley b12), ca. 1788 – Source. While wartime service forced an end to the relationship with Jung, the year Paul Mellon enlisted was also the year he began to collect important works by Blake, an artist in whom Mr. Mellon found new interest through Jung’s exploration of the unconscious and his theories about collective archetypes. In 1941 he acquired some exceptional books. This included There is No Natural Religion (1794) [fig. 1], an “illuminated” book of eleven color-printed relief etchings with pithy text critiquing the reductive philosophical materialism of his day; a set of the engraved Illustrations to the Book of Job (1825) in its original binding; and a copy of Blake’s engravings illustrating Edward Young’s Night Thoughts (1797) [fig. 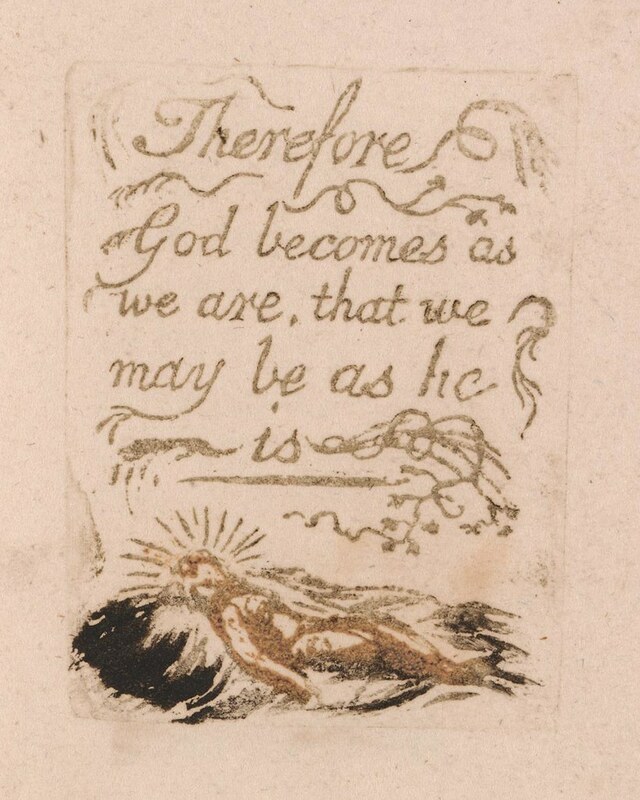 2], one of two copies believed to have been hand-colored by Blake himself. Fig. 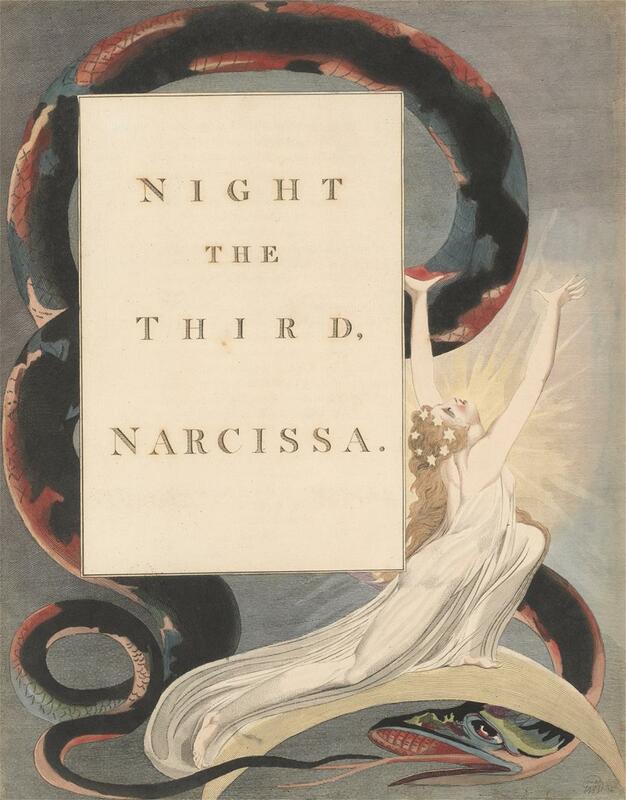 2: Young’s Night Thoughts, Page 43, “Night the Third, Narcissa”, 1797 – Source. 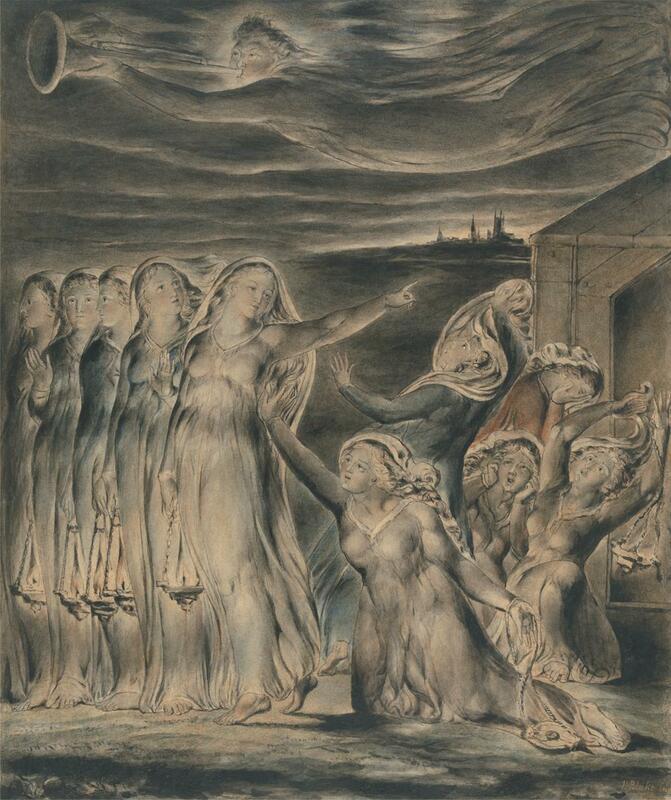 Another very significant acquisition in 1941 was a version of Blake’s illustration to The Parable of the Wise and Foolish Virgins [fig. 3], made around 1825 for William Haines of Chichester and one of four replicas of an original design drawn for his patron Thomas Butts in around 1805. Blake adapted the traditional iconography of the judgment of souls to capture the underlying theological meaning of the parable (Matthew 25:1-13), but in the Mellon version the setting has become distinctively English with its distant Gothic spires. It was also one of the first English drawings acquired by Paul Mellon who would eventually form the most comprehensive collection of English works on paper outside of Britain. Fig. 3: The Parable of the Wise and Foolish Virgins, ca. 1825 – Source. The mid-1940s were a difficult period in Paul Mellon’s life. Looking back he recognized how the destruction and privation he had witnessed in the war had changed him and the extent to which his wife’s death “overshadowed my life for some time.”6 He found solace in collecting, returning to the work of Blake and acquiring important books such a copy of the Songs of Innocence and Experience (1789, 1794) in 1947, the two books bound together in one volume by Blake’s friend George Cumberland; and a copy of Europe a Prophecy in 1948. Blake wrote Europe in 1794 and printed it in 1795, the hand-coloring in Mr. Mellon’s copy believed by some scholars to be the work of Blake’s wife and collaborator, Catherine. This copy was particularly significant for having been in the Disraeli family, bought by Isaac D’Israeli in the 1820s and bequeathed to his son, Benjamin Disraeli, the future Earl of Beaconsfield, in 1848. Europe dealt with that continent’s history from the time of Christ to Blake’s own day, exalting liberty and attacking especially the repressive forces of monarchy and clericalism. 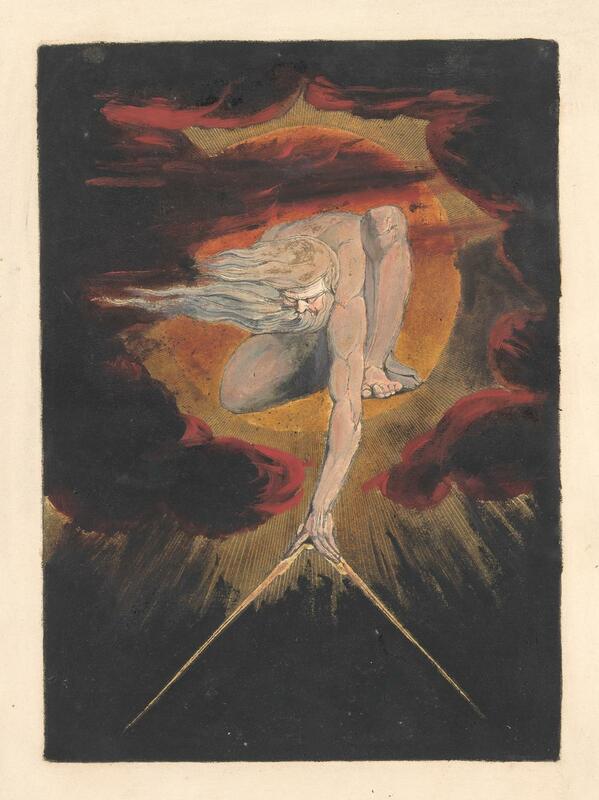 Its frontispiece, one of Blake’s most celebrated designs, represents the repressive figure of Urizen compassing the earth, attempting to measure and constrain the infinite [fig. 4]. Fig. 4: Europe. A Prophecy, Plate 1, Frontispiece, 1794 – Source. 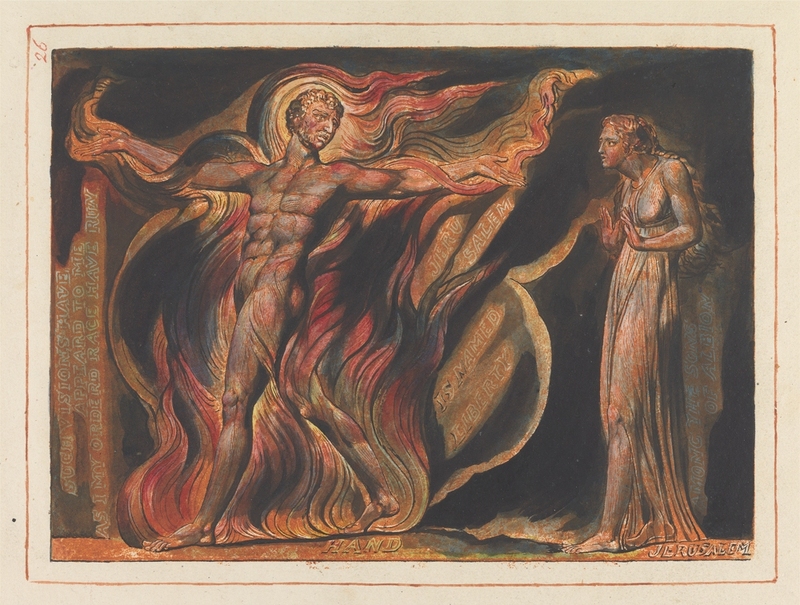 In Blake’s complex, personal mythology, the figure of Urizen embodied conformity, and the repressive, rationalist, and materialistic philosophy of the age. Urizen was the enemy of all Imagination, who corrupted the natural ability of people to see things in their true essence. Blake contrasted him to Los, to whom he was once joined, and who represented for Blake the imaginative faculty and the spirit of revolution. Fresh from the horrors of war in Europe, disconcerted by the rising materialist spirit in post-war America, and concerned to help those afflicted with mental illness, Paul Mellon perhaps found resonances in Blake’s impassioned text and images, written as Blake watched the liberating promise of Revolutionary France descend into the bloodshed of the Terror and the spread of war across the Continent. Fig. 5: Jerusalem, Plate 26, “Such Visions Have….”, 1804 to 1820 – Source. Only five complete copies survive and this unique, hand-colored copy printed in orange ink was retained by Catherine Blake after her husband’s death and was bequeathed to Frederick Tatham when she died in 1831. Tatham was one of the Ancients, the young brotherhood of artists yearning to restore art to its primitive simplicity and who discovered the neglected and penurious Blake in his final years. Tatham had taken Catherine in after William’s death and received from her not only works by Blake but also anecdotes of his life which he wrote down and bound with the Mellon copy of Jerusalem as well as a visionary drawing by Richmond of Blake in youth and old age [fig. 6]. after Frederick Tatham, ca. 1830 – Source. By the late 1950s Paul Mellon had begun collecting British art with a new earnestness. His first collecting from the 1930s had been chiefly focused on books and some sporting paintings, but this developed into acquiring paintings and sculpture, as well as prints and drawings. In 1948 he married Rachel “Bunny” Lambert, and the new Mr. and Mrs. Mellon became the foremost art collectors in the United States and icons of elegant and understated style. Naturally his approach to Blake evolved too, with the acquisition of more drawings to go along with the illuminated books and prints. In the 1950s he bought rare landscape studies, and 1961 he acquired Blake’s tempera painting of the Virgin and Child followed the next year by what would become one of his favorite works of art: Blake’s miniature Horse [fig. 7]. Fig. 7: The Horse, ca. 1805 – Source. 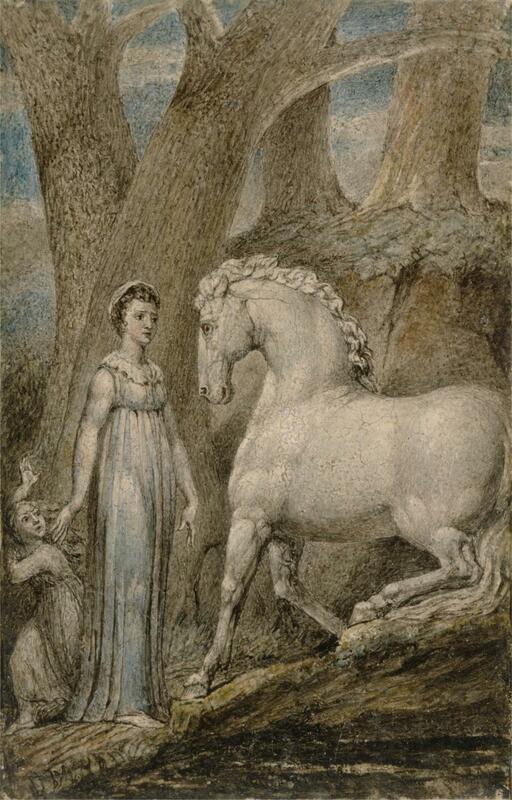 This tiny tempera painting was made on a copperplate in around 1805 when Blake was working on illustrations to a new edition of the poems of William Hayley, here illustrating a ballad in which a mother steps bravely between her child and a fierce Arabian horse and tames it.9 Paul Mellon kept it in his Manhattan study until his death in 1999, an object combining his three chief passions for art, literature and horses. 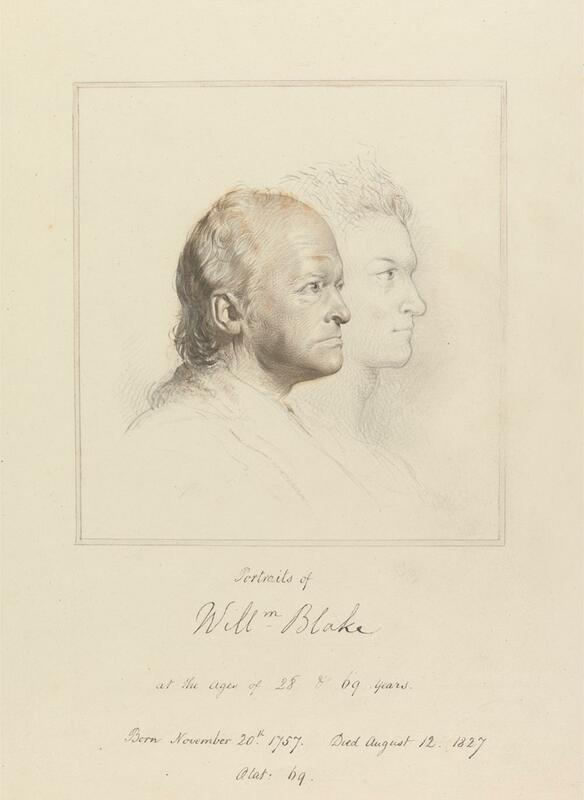 But it was in 1966 that Paul Mellon made his most significant acquisition of Blake drawings, buying the Illustrations to Gray’s Poems, a complete set of drawings to the collected works of Thomas Gray. These were made for the sculptor John Flaxman who approached Blake in around 1797 to illustrate Gray’s poetry as a birthday gift for his wife, Nancy. 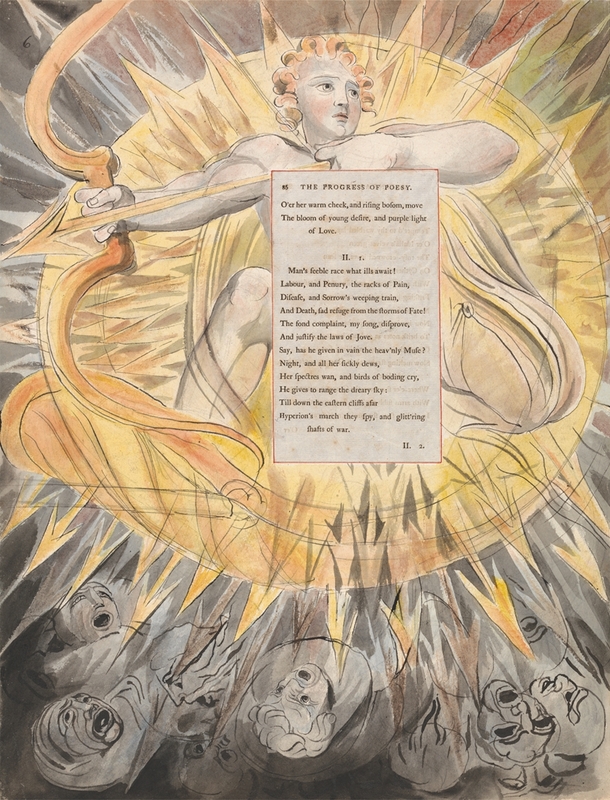 A printed edition of Gray’s poems was dismembered and attached to the center of fifty-eight large sheets of paper on which Blake drew his own designs. Despite illustrating another poet’s work, one of the most striking and characteristically Blakean sheets represents Hyperion, father of the sun, bursting forth to banish darkness and suffering [fig. 8]. The Poems of Thomas Gray, Design 45, “The Progress of Poesy.”, ca. 1797 – Source. Matthew Hargraves is Chief Curator of Art Collections and Head of Collections Information and Access at the Yale Center for British Art. He specializes in British art of the seventeenth, eighteenth and nineteenth centuries and is the author of Candidates for Fame: The Society of Artists of Great Britain (Yale UP, 2006); Great British Watercolors from the Paul Mellon Collection at the Yale Center for British Art (Yale UP, 2007); Varieties of Romantic Experience: Drawings from the Collection of Charles Ryskamp (YCBA, 2010); and A Dialogue with Nature: Romantic Landscapes from Britain and Germany (Paul Holberton, 2014). 1. Paul Mellon with John Baskett, Reflections in a Silver Spoon: A Memoir (New York: William Morrow and Company, 1992) p. 284. I am very grateful to John Baskett for kindly sharing his knowledge of Paul Mellon’s life and collecting with me, and to Amy Meyers and Scott Wilcox for their careful reading of this article. 4. Ian MacPhail and Laurence C. Witten, “The Mellon Collection of Alchemy and the Occult” in The Yale University Library Gazette 41:1 (July 1966) pp. 1-15. 5. Jonathan W. Engel, “Early Psychiatry at Yale: Milton C. Winternitz and the Founding of the Department of Psychiatry and Mental Hygiene,” Yale Journal of Biology and Medicine, 67 (1994) p. 34.